The Peerless Power of Comics! : When Wakes The Ultimate Mutant! When Wakes The Ultimate Mutant! 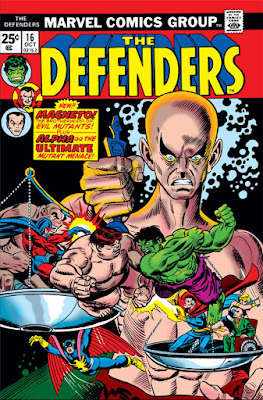 In the fall of 1974, The Defenders was just settling in to the change in course that came with the departure of all but one of its original members, leaving Dr. 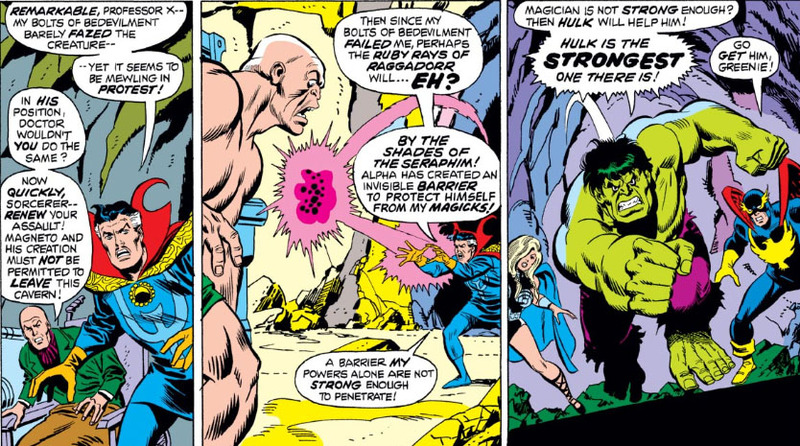 Strange as the only non-member of the non-team left to promote the "Defenders" concept--something the sorcerer all but took pride in, judging by his behavior in their company. 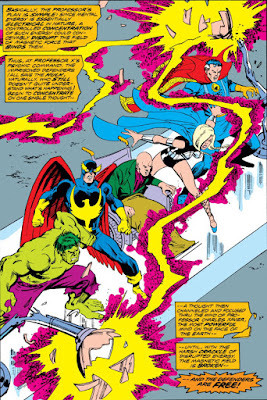 Both departing writer Steve Englehart and his replacement, Len Wein, seemed to be of one mind in having the formerly reclusive Strange adopt a much different profile that saw him embrace the attitude of a "team player," a stance that the Defenders' newest addition, Nighthawk, no doubt was happy to support in his own new role as a super-hero. Yet the revised lineup is already on shaky ground, with the Valkyrie announcing her intent to depart in order to explore the life of the host body her persona inhabits--Barbara Norris, who was mystically joined to the Valkyrie by the Enchantress soon after Barbara was liberated from the realm of the Nameless One. A bad time for this new "team" to begin to fragment, considering the seasoned group of villains that they'll soon be forced to test themselves against in battle. 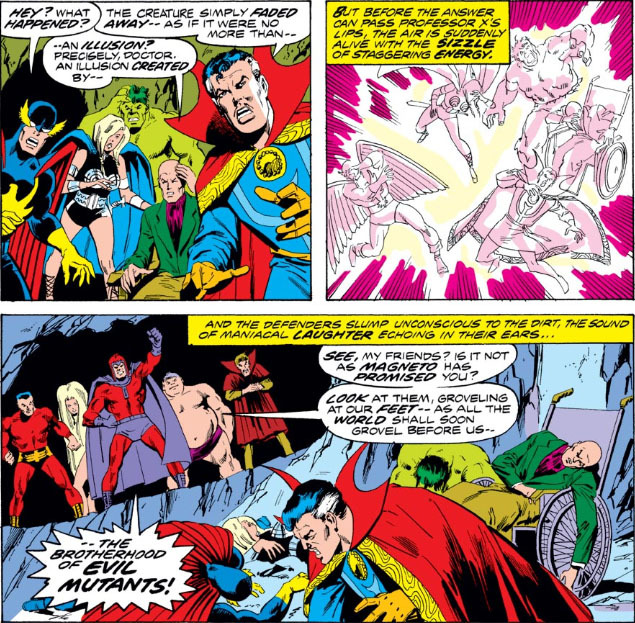 From that point, though, the story wastes no time in getting to the action--thanks to the unexpected entreaty of Professor X, who seeks the group's assistance in New Mexico's Carlsbad Caverns. Once the Hulk joins them and they enter the site, the Defenders are surprised by the attack of a walking horror that their abilities don't affect, a threat that fortunately proves to be no more real than an illusion that Xavier can disperse. But the attack which follows is all too real. No, I haven't the slightest idea why Xavier didn't give his allies a heads-up on who they'd be facing, or why the Defenders didn't inquire about the details of this "menace" that so alarmed him. As a result, all of them have blundered their way into captivity--and their host has every right to gloat. Obviously Magneto hasn't changed his tune--still bent on conquest, aiming to forcibly put mutants in control of the planet and achieving his goals through no small amount of violence. 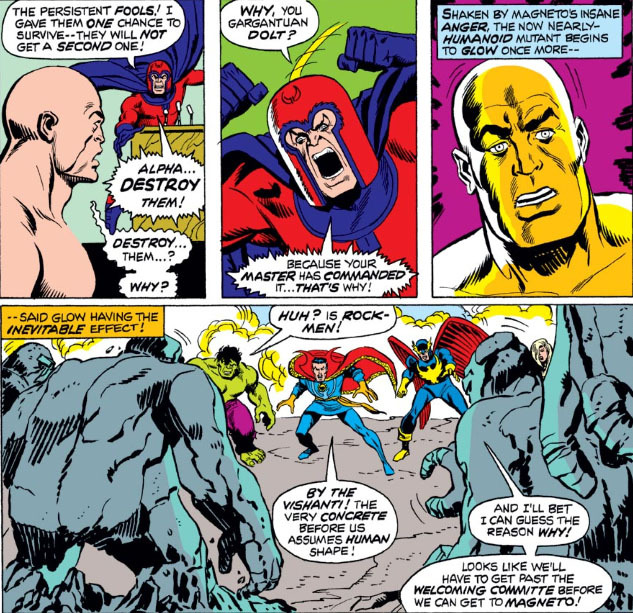 In the early '70s, Magneto is still very much the two-dimensional villain that Marvel can plug into practically any story that needs an A-list threat, no questions asked; in fact, later in this story, in the finest tradition of villainy, he'll utter the single word that marks any raving evildoer whose adversaries have gotten the better of him. (There's a free comic book in it for you if you can spot it! Not really!) Magneto is still a few years away from having his character expanded to explore more of the man behind the helmet and providing new perspective for his actions. For now, he's out to aggressively seize world power, by any means necessary--and it looks like he's developed a new, powerful tool to finally put that goal within reach. 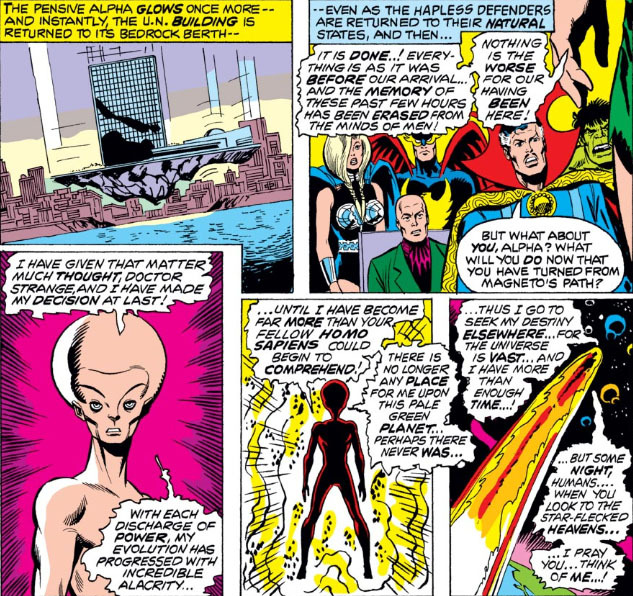 Those of you who remember Magneto's previous encounter with the Avengers saw the villain fall victim to a single blow from the Vision (disguised as one of Magneto's trusted aides)--yet it turns out Magneto was only a prisoner for a few months before gaining his freedom, thanks to an astronomical event. 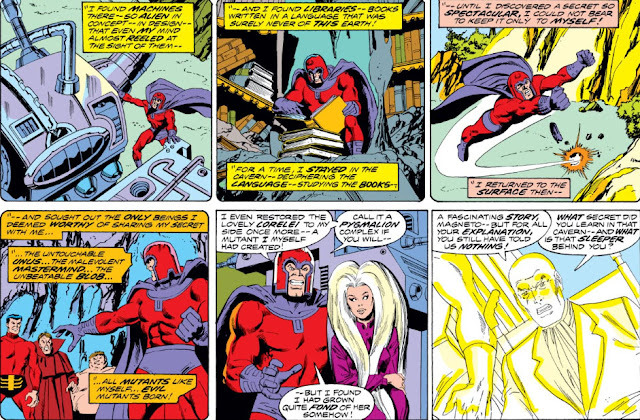 It sounds as if Magneto is once again tinkering with creating his own mutants--except that this time, rather than mutating human subjects (such as Lorelei), he's incubating one from scratch using the machinery he discovered beneath the Earth. And if one is all he feels he needs, Magneto may actually make good on his threat this time. But he's already made a mistake in leaving the Defenders unattended*, since it's almost a given that they have every intention of breaking free of this device. *An entire brotherhood of evil mutants, and not one of them was assigned to stand guard? Since Magneto's "ultimate mutant" is waiting in the wings, the Defenders' face-off with the Brotherhood only provides a token display of battle scenes that play out as you might expect. Suffice to say that the Defenders exploit vulnerabilities in the Brotherhood that allow them to eventually triumph, in order to face the main event--and it, them. "Not so long as a Defender draws breath!" 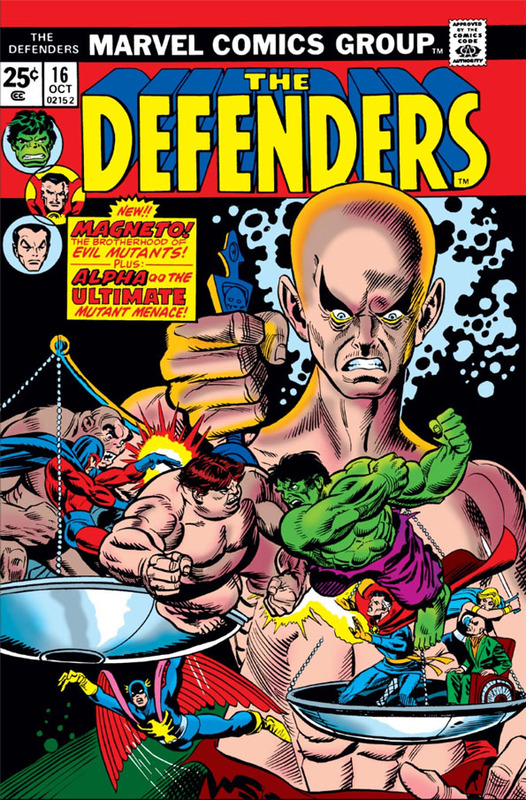 The words have been used by other groups and heroes at other times, but somehow hearing them applied to the Defenders--who band together "only when the need arises," according to their splash page description, and have no solid organization to speak of--feels off. And to hear the rallying cry spoken by the contemplative Strange easily provokes a double-take. Do these people really gather so often that they can respond to team pride--or rather, non-team pride? We could substitute "Not so long as any of us draws breath!" and be just as tempted to turn the page and see this story unfold. At any rate, Strange's bravado--words which sound equally odd in a sentence--proves futile, as Alpha easily withstands their initial assault. 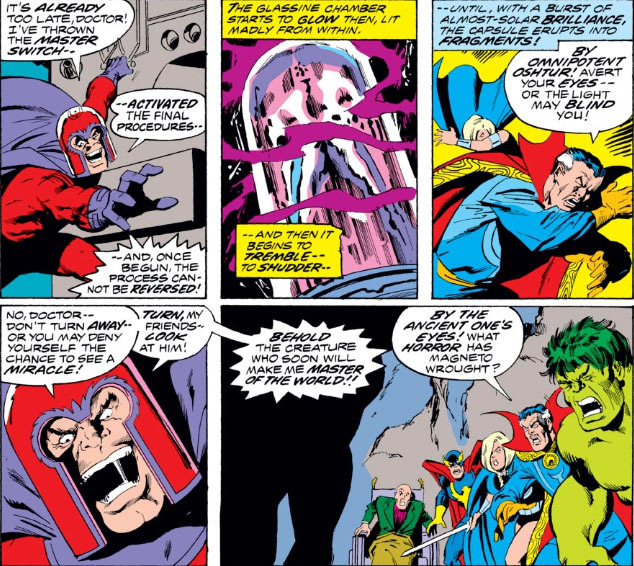 In addition, Magneto is so confident in the power of his new creation that, instead of ordering Alpha to destroy their foes, he decides to seal them in the caverns in order to give them ample opportunity to realize how helpless they are to oppose him. Once free, Xavier determines that Magneto has headed to New York, where he makes another visit to the United Nations--only this time, he has no need to mince words as part of an elaborate deception, but cuts right to the chase. Naturally the Defenders "rise" to the challenge (so to speak)--though a What If tale based on Magneto's power play here would have made for an interesting read, if the distractions of various heroes trying to stop him had been taken out of the mix. We've seen the U.N. grant Magneto sovereignty of the island nation of Genosha, which allowed him to turn that country into a sanctuary for mutants--but it's unlikely the U.N. is empowered to meet Magneto's terms here and grant something on this scale. I would have liked to see what the writer would have come up with. 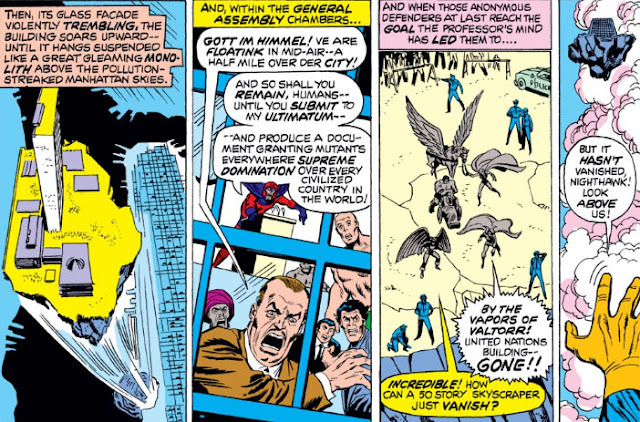 But in the here and now, the Defenders arrive to face Magneto for the final time, and Magneto immediately turns to Alpha to eradicate them, once and for all. 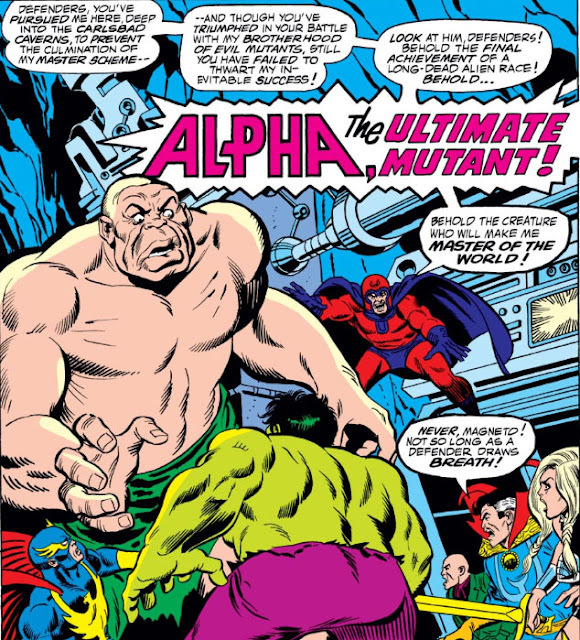 Yet Alpha appears to be evolving, and Magneto's tool is becoming less compliant with his dictates. When the dust settles, it seems there's no stopping the Defenders at this point--and one in particular. Settle down there, Nick Fury. Jeez, the Ancient One would hardly recognize you. Magneto, meanwhile, is growing impatient with Alpha--considering him no more than a tool to be used as he sees fit. 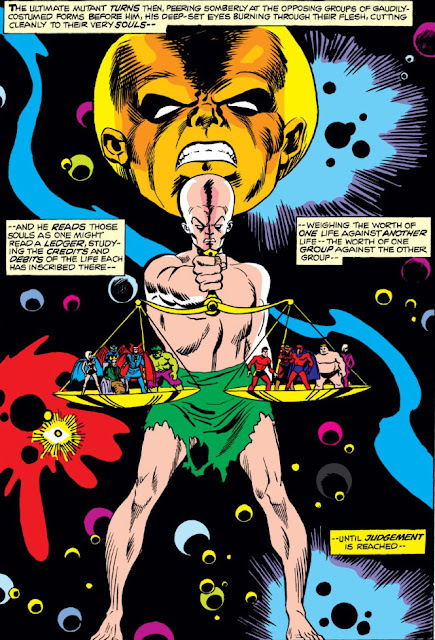 But with each use of his awesome power, Alpha is undergoing changes in both appearance and intelligence, the ramifications of which are already being realized by the one who viciously tries to reassert his control. It's apparent now that Alpha has been misinformed by Magneto, who's sought to bind him to his will with lies about the Defenders' motivations and character. 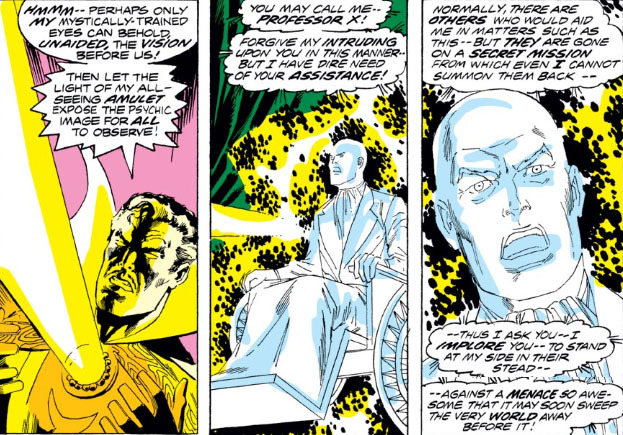 But it's when Nighthawk and the Valkyrie fall before him that Alpha undergoes a more startling transformation--and when Xavier presents Alpha with a different point of view of his subjugator, this time Alpha considers more than the snarling of his master's voice that urges him to listen only to him. This time, he judges the truth for himself--in ways more intense and revealing than few of those under his scrutiny are prepared to comprehend. The judgment made, and the threat dealt with, Alpha takes the additional step of erasing any evidence of the events that took place at the U.N. (has even Alpha heard of news feeds or reporters' notes that would escape such a sweep? ), and prepares to depart the Earth, which is ill-suited to become this new being's home. But he leaves something in his wake that's going to have babysitters everywhere rethinking their vocation. Alpha's "destiny," unfortunately, led him to a period of captivity on the Stranger's lab world alongside the similarly-evolved Futurist, with both eventually gaining their freedom when the Over-Mind released all the Stranger's specimens to spite the enemy who defeated him on Earth. Which in a way adds a sense of symmetry to this story, given that the Over-Mind later becomes a Defender. It's a strange universe, indeed. Is the word you’re thinking of dolt? I'm not asking for a no-prize, already being dangermash TTB, curtesy of Steve Does Comics. I got it! Obviously, the word is "NAARRGGHH"! "Not too terribly long afterwards.." - is this the usual description of the journey when flying from New York to New Mexico? Just how fast are winged horses? The Carlsbad Caverns setting seems so pointless - they make no use of anything specific to the caverns themselves, and the finale takes place in the same city they started in. Couldn't they have found a cave system upstate? Incidentally this would have made more sense for Professor X as whatever vehicle he used to get to New Mexico is still there. Unless he used public transport, that is. Tiboldt, I'm thinking that maybe Carlsbad was near Magneto's exit point from the caves where he found the alien technology? Otherwise, I agree that there seemed to be no rhyme or reason to the choice of location. Do I get some kind of no-prize for this scintillating stuff? Please? 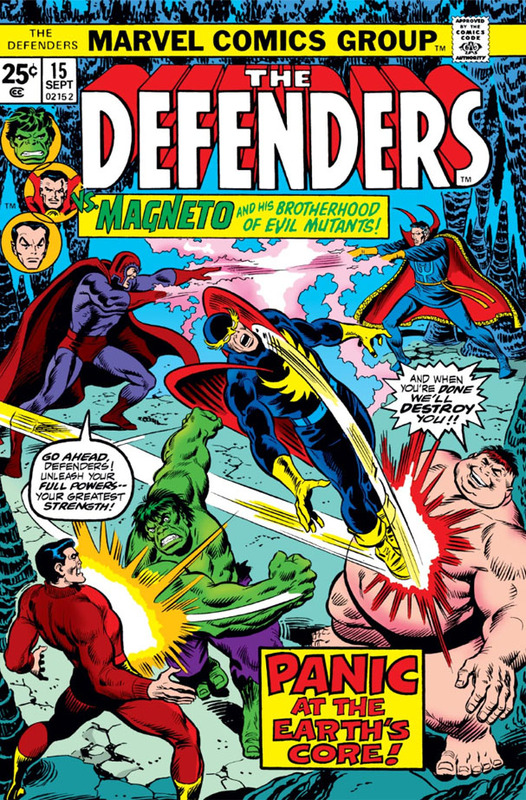 Think it is funny how Magneto used to be just a good overall Marvel villain who showed up all over. He was pretty one dimensional, but I enjoyed his appearances in non X-men books through the 60s and early 70s. First Flight Of The Vulture! The Threat To Three Worlds! Can YOU Name The Real Lunatic Legion? The Last Conquest of Harokin The Barbarian!